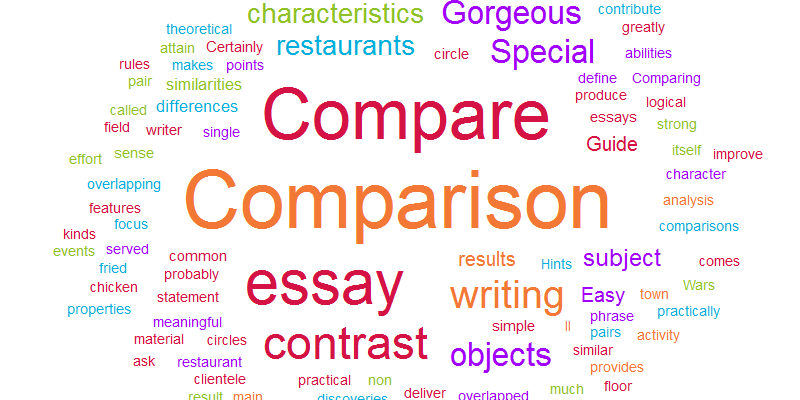 Home » Blog » How to Write a Compare and Contrast Essay? Compare and contrast essays are called to analyze the differences (or probably similarities) between the two (or sometimes more) subjects. Certainly, it should not be a simple statement of the existence of differences or similarities. The results of the comparative analysis should have a meaningful implication of practical and/or even theoretical character. Comparison itself is a strong logical tool and the writer can attain much with its help. Comparing two or more objects by several characteristics may produce unexpected results and even discoveries. Comparison provides a wide field of activity. You can compare practically any pair of objects. Certainly, it makes more sense to compare objects from one family, like the consequences of two discoveries, results of the World Wars I and II, or properties of different metals. So, when the floor comes to me, who can help me write my essay of compare and contrast? To improve the results of your effort of writing an essay, there are a number of rules and principles that, together with your own abilities, will greatly contribute to the result. Different kinds of comparison objects determine different question that you ask about them. You may compare historical periods or single events, theories and ideas or different people. Both approaches surely have their pros and cons. Thus, a subject-by-subject comparison may turn to be two simple lists of characteristics. While a point-by-point comparison may ignore important features of the objects of comparison. To avoid such misfortune, the writer needs to choose a correct focus and a proper sense of proportion. It is commonly recommended, prior to writing such an essay, to create a list of difficulties and similarities between the two objects that you have chosen for comparison. It is even suggested to draw two partly overlapping circles and write the objects’ characteristics on the overlapping and non-overlapping sections to denote common and different point. For example, there are two restaurants, Special and Gorgeous. They are both restaurants but work differently. There are dished that are served in both restaurants, and there are such that are served in only one of them. Suppose both Special and Gorgeous serve fried chicken, but Special will deliver it home, while Gorgeous will not. In the overlapped section (common for the two circles), you write “Serves fried chicken”. In the non overlapped part of the Gorgeous circle you write “No delivery” and on the similar of part of the Special circle you write “Will deliver”. In this way you collect different characteristic and pairs of answers for the two restaurants. And, over time, you have material for a detailed comparison. In the other dimension, writer can opt between the subject-by-subject and point-by-point comparison types. The terms are clear and intuitive. Certainly, In the subject-by-subject comparison, you first write about the “Gorgeous” restaurant, describing, (most likely, in short paragraphs), its most essential characteristics (features, points). You write about its dishes, location, ambience, ingredients, clientele and probably other meaningful points. Then you in the same fashion describe the “Special”. That’s essentially a fine and logic manner of comparison. Alternatively, when you compare clientele in the restaurants “Special”, “Gorgeous” and “Palmira”, which is the third restaurant in the town, it is the point-by-point approach to comparison. It is obvious that a simple sum of differences and similarities usually makes little sense and is of little importance. To produce a successful essay of this type, you should define a right focus. That is, to select the characteristics, where the comparison between two or more given object(s) will be striking, provoke emotions and become material for further investigation. In accordance with the common hints on writing essays, the introduction should usually include a phrase that somehow declares the whole work’s contents and its dominating idea. In a compare and contrast essay, the thesis statement normally sounds as follows: “Special and Gorgeous are both restaurants in my town. Being similar in many ways, they however have important differences”. The main part is a data base of comparisons pairs of the numerous characteristics of the compared objects. However it is a good tip to end the main part with a phrase that unites the results of the comparisons of individual characteristics in a single idea. Such idea should be present in the conclusion as well. Author may conclude with one or more statements about practical prospects of visiting corresponding restaurants. For example, it is possible to define a circle of people for whom the “Special” will be the best option to visit and for whom the “Gorgeous” is definitely more suitable.